"Things happen, in life, pretty crazy at times you least expect things to happen." "I haven't talked to anybody publicly about it. And really, it's kind of ... I know we're public figures, or whatever you wanna say, but it was kind of a private matter even though we played together on stage in front of 14,000 people or something." "Over the years, especially in business and what-not, if you have a fracture in business, you start to demonize each other and if it's a public fracture in business, other people help you demonize ..."
"It was kind of goofy ... As soon as I played last Thursday, my e-mail was just going crazy ... It was Rolling Stone [magazine] and whatever or what-not. 'Can we get a quote or statement?' And I don't have a statement." "It's really not that big of a story. It was really kind of ... It was great." "I got to London last Thursday. I was there on separate business — a separate business even from music. I checked into the hotel in London I stay at all the time. And the hotel manager came, 'Hey, Duff, we'll show you up to your room.' He goes, 'So you're playing tonight?' And I said, 'No, no, I'm here on just business this time — I'm not playing this time around.' And he looks at me strangely. 'What? You're not playing tonight?' I had no idea Axl [Rose] and Guns N' Roses were in London — I had no idea. So we're going up the elevator and he said, 'You know, Axl is in the room next to us.' And I had to go straight into meetings. All the meetings were ... I was staying in sort of a conference room and bedroom — it was a conference room on one side of the wall and the bedroom on the other. And I went straight into these meetings and these were with sort of Wall Street people. So it was very serious meetings I was into, something I had worked on for a year. So I'm in these meetings and my phone starts ringing later on in the day in my hotel room; it was kind of managers and tour managers. The word [was] out I [was] in the hotel. 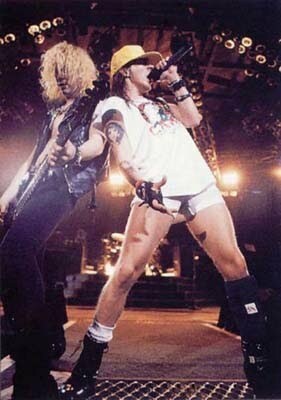 And it came down to the simple fact... Axl and I just sort of met up, we saw each other and we hugged. I went down to the gig with him. There were a couple of guys hanging out. There was a lot of, sort of... Like what I was saying, you go through a lot of stuff in business and there's some fractures and demonizing of each other and I think, if nothing else, a couple of old friends maybe got over some of those hurdles and had a nice talk. And I don't want to do anything here to cheapen that by saying anything to you guys, but we had a nice dinner the day after the show, and that was it." "Yeah, I missed it. I did. I missed it. And it couldn't have happened in a more odd way, really." "The show is going on and I'm watching it. And somebody comes over with a bass ... 'Now, I haven't played 'You Could Be Mine' since 1993. A lot of the other songs, like 'Paradise City' and 'Mr. Brownstone' and 'It's So Easy', I've played with Velvet Revolver or Loaded, but 'You Could Be Mine', I was, like, 'Oh, God. OK, I can play it. I think I remember it.' There's a bridge there. I'd forgotten the second part of the bridge, and I had to look at Bumblefoot [chuckles], his guitar neck, to see where the next guitar chord was. But, yeah, it was fun. I had a great time." "It was a little but heavy. When people saw it ... It wasn't heavy for me so much. I was kind of more concerned about the band that he's put together — great, great players [and] great guys. I've gotten to know Bumblefoot and Tommy and Frank, the drummer. And, of course, there's Dizzy. It's a great band and I didn't wanna do anything to lessen what they were doing." "I have nothing to say about it. It's not ... I don't know. It's not anything that I worked or planned for. I work and plan for my kids next year in school, or my business, or indeed Loaded. But that kind of thing, it's not something I sit there and go, 'OK, one day this is gonna happen.' Last thing happened, and it was very serendipitous, and the blood was in the water, no doubt. After that show in London, I could have gotten a free dinner and free car service everywhere I went every night I was in London after that. And I had to kind of hide. I went and saw Ronnie Wood play Tuesday night, and I had to kind of watch out for the sharks running about, even at that gig — it was kind of a private gig, and there were the manager types and the agent types. All of a sudden I was a little more handsome than I'd been before I came to London because everybody was complimenting me. 'Hey, Duff, you look great.'" "Well, for me, the big thing is, what's my part in it? We can all look back at our pasts and go, 'Well, he did this to me and ...?' [And you have to step back] and take a look in the mirror. What was my part in it? And that's what I've been working on for the last 10 or 15 years, but really in the last five years, and it's a work in the progress. You always paint yourself a little glossier in your own past in your life. I could have done things different — probably sometimes a lot better; sometimes I could have done things worse. But I look at my part and my accountability. I'm a grown-up; I take accountability for myself and my actions these days. I've got nothing to fear and I've got nothing to be ashamed of. What I've done is what I've done; what I'm gonna do is what I'm gonna do. I have fun while I do it now. Every day I wake and go, 'OK, let's go.' Joke time. I'm lucky to be here, and I don't forget that every day." ard - How do you like them apples? I'm beyond delighted with this words from Duff. Forget the fact that he's our Duff and he's a musician: what a great human being one needs to be to do what he has done. and thanks again - Mack :) these last 2 posts are great achievements for the blog, since they're not that easy to find!